In the manufacture of sterile injectables, the risk of protein aggregation is a fact of life for large-molecule drugs. While prefilled syringes are particularly susceptible, vials and other container types are also at risk. An array of triggers can cause proteins to aggregate, or clump: from substances used during manufacture to shipping and storage conditions. Should patients take a compromised drug, their immune systems may perceive the modified proteins as harmful and attack them (an immunogenic response). Ranging from mild to severe, effects can include drowsiness, headache or diarrhea all the way through to embolism, internal bleeding or death. In this three-part series, we will examine what causes protein aggregation and practical steps you can take to mitigate the risk. 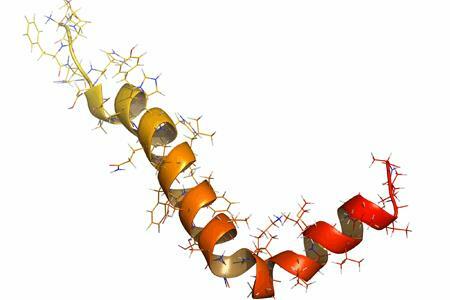 What provokes proteins to aggregate? Proteins naturally have hydrophobic regions on both the exteriors and interiors of their structures. But when a trigger causes proteins to unfold and then refold incorrectly, their structures change, exposing many of the formerly buried hydrophobic “patches.” These patches attract each other like magnets, causing the misformed proteins to clump together. Sometimes aggregation occurs when the proteins remain intact but the equilibrium of the entire solution is disturbed, causing a cascade of events that trigger aggregation of the protein molecules. A variety of factors can cause protein aggregation. Here are some of the most prominent. Silicone is a ubiquitous lubricant used in the manufacture of both prefilled syringes and vials. Sprayed inside syringes prior to filling, silicone oil enables the rubber stopper to glide along the glass barrel during drug administration. Sprayed on vial stoppers, silicone helps stoppers slide into place during the filling and capping process. Silicone is always a prime suspect in cases of protein aggregation, since it generally interacts with protein and can trigger the aggregation process. If droplets of silicone, which is hydrophobic, end up in your solution, they can attract the hydrophobic patches on your proteins and cause them to clump. Some companies use “baked” silicone for their prefilled syringes. Baked silicone, which is heated dry, adheres more firmly to glass barrel walls than liquid silicone, which is left to dry on its own. While less likely to drip, baked silicone can develop a crust that can flake off into the solution when the syringe is filled, acting as “seeds” for protein aggregation – in addition to rendering your drug non-compliant. Tungsten. Specific to prefilled syringes, the presence of tungsten residues is a long-known issue. Studies conducted over the years demonstrate tungsten’s negative effect on proteins(,,), even at the trace levels often found in glass syringes. Tungsten comes into play during the manufacture of the syringe itself. While the glass is still malleable, a tungsten pin is pushed in and out of the barrel to form the hole where the needle will be inserted. During the process, the hot glass pulls tungsten ions out of the pin and into the neck of the syringe, where they remain as traces. Once the biologic is filled, these ions can leach into the protein solution. Over time – sometimes only days – and depending on the drug’s specific sensitivity to oxidation and storage conditions, tungsten can render your medication ineffective or unsafe due to protein aggregation or degradation by-products. Peroxides. Peroxides are extremely powerful oxidizers. Hydrogen peroxide, which is commonly used in vapor form to sterilize injectable filling suites, can create radical peroxides that are very harmful to proteins. Mere traces, even 10 parts per billion, can trigger oxidation and protein aggregation. Light. Light, direct or indirect, can degrade (oxidize) proteins or excipients in a biologic formulation. During compounding, pH and temperature are often used to stabilize a formulation by creating an optimal environment for other ingredients to be mixed in. However, swings in pH and temperature can become powerful catalysts of protein aggregation, given their propensity to affect protein structure. Changes in pH generally occur during the compounding process, as you make adjustments to the pH level of your solution. After filling, pH swings are unlikely, unless your formulation possesses high pH and high salt concentration and the glass is not a good match for your drug product. Such a combination can alter pH and cause glass degradation (corrosion), as well as glass particle formation. Temperature swings can occur both during compounding and post-manufacture, such as during transport or storage. Excursions can lead to undesirable interactions between silicone, rubber stopper, headspace and the drug product, resulting in protein aggregation in both vials and prefilled syringes. Depending on conditions, aggregates may also form a crust around the stoppers of prefilled syringes, which can prevent or hinder plunger movement. Choosing the right excipients is the heart of a stable drug formulation. They must “agree” with your protein and be added in the right way, at the right time and in the right amount; otherwise, sooner or later your proteins will aggregate and your drug will destabilize. We discuss formulation components at length in Part 3 of this series. Stainless steel. While most fill-finish equipment is made from stainless steel because it’s relatively inert, some proteins don’t “like” the material. They will pull ions out of the steel, which in turn oxidizes the proteins. Rubber. Protein can interact with rubber surfaces, which are hydrophobic. Moreover, rubber contains dozens of compounds that can leach into your solution, or your solution can extract these harmful compounds from the rubber. Headspace. Headspace can contribute to protein aggregation by providing a suitable environment for external forces to act upon the air-liquid interface, such as foam formation and shear stress caused by shaking during transport. Vibration. Shipping vibrations can trigger aggregation, by itself or in combination with other factors, such as headspace, particulate matter and/or silicone. Is your biologic at risk? Once your samples have been stressed, assessing the mechanical operation of your devices by, for example, determining changes in their glide force and break-loose force. The functionality of prefilled syringes can be affected if protein aggregates around the plunger, creating a crusty ring. Follow those indicators over time and storage conditions as part of a thorough stability study. The techniques to use will depend on the protein molecule and the availability of analytical tests and/or instrumentation at the executing lab. Determining how much or little your protein can tolerate under variety of storage and transportation conditions can help you prevent do-overs as you develop your biologic. This helps ensure that the quality of your drug remains intact when patients use it. In Part 2 of this three-part series, we will discuss how to prevent protein aggregation via considerations for the manufacturing process and container selection criteria. In Part 3, we will examine drug formulation and quality by design. Precipitation of a monoclonal antibody by soluble tungsten. Bee, J.S., Nelson, S.A., Freund, E., Carpenter, J.F., and Randolph, T.W. (2009) Journal of Pharmaceutical Sciences 98 (9): 3290-3301. Tungsten-induced protein aggregation: solution behavior. Jiang, Y., Nashed-Samuel, Y., Li, C., Liu, W., Pollastrini, J., Mallard, D., Wen, Z.-Q., Fujimori, K., Pallitto, M., Donahue, L., Chu, G., Torraca, G., Vance, A., Mire-Sluis, T., Freund, E., Davis, J., and Narhi, L. (2009) Journal of Pharmaceutical Sciences 98 (12): 4695-4710. Root cause analysis of tungsten-induced protein aggregation in pre-filled syringes. Liu, W., Swift, R., Torraca, G., Nashed-Samuel, Y., Wen, Z.-Q., Jiang, Y., Vance, A., Mire-Sluis, A., Freund, E., Davis, J., and Narhi, L. (2010) PDA Journal of Pharmaceutical Science and Technology 64 (1): 11-19. Determining Protein Oxidation Induced During Fill-Finish Operations. S. Benjwal, M. Yang, A. Jangda, A. Lund, K. Konstantinov. (2014) Pharmaceutical Technology Volume 2014 eBook, Issue 2.